With the first round of group games complete in the UEFA Champions League, all I can think of are the gifts certain teams, and one particular player, gave their opposition. * Could Manchester United have picked up three points if Sir Alex Ferguson picked his strongest eleven? I think they could have. When I saw the lineup Manchester Untied picked, along with the fact that Berbatov and Scholes were not in the lineup, and I don't think I'm the only one who had this thought: bet Rangers on the Asian Handicap line of +2. When you know your opposition is going to play a defensive game, having someone who's known for long distance shots (Scholes), and one who's creativity seems to be finally coming back to him (Berbatov) at least on the bench would have been a wise idea. Instead, Rangers perfectly set themselves up for a point. 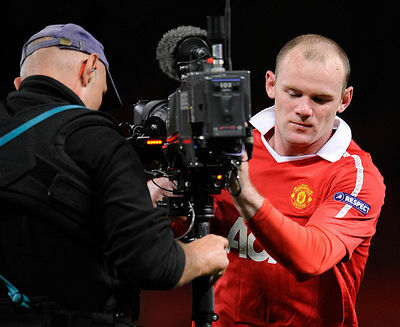 The Scottish outfit forced Manchester United into long distance and odd angled shots. Whenever any dangerous ball came close to the six, McGregor had a firm handle on the situation. * There is one image from the Manchester United/Rangers game that I still have not gotten out of my head: the sight of Antonio Valencia's broken leg. While no replay was shown, the one and a half seconds it took for the cameras to pull away from the injury is something that gave me nightmares Tuesday night. It also made me feel guilty that I never had that same reaction whenever Eduardo and Aaron Ramsey broke their legs. I wish Valencia nothing but the best and here's hoping to the speediest of recoveries. * If there is one person you can solely put the blame on for Tottenham blowing a two goal lead at Werder Bremen, it's Benoit Assou-Ekotto. It takes a genius to blow two different assignments in the process of the same sequence. His 'clearance' that started Werder Bremen's move was nothing but stupidity. He never had the right footing, and was forcing it more than making a rational move. His blown assignment in assisting Ledley King, seeing the cross go in that led to Bremen's opener, should have seen him immediately subbed out of the game and promptly put on the transfer list. With those two moves, Tottenham went from being in firm control to only being a goal up and on the back foot the final forty-five minutes. Sure, it didn't help Harry Redknapp had to subbed off Rafael Van der Vaart, but those are two points Tottenham may want back come matchday six. At least Twente and Inter Milan bailed them out drawing 2-2. * It was embarrassing to see the defending Sporting Braga had on offer against Arsenal. With the way the Gunners carved them up, I was wondering if Arsenal was working on their own connect the dots book. It didn't help that Braga's keeper gave up such a cheap penalty only 9 minutes into the match. Arsenal's passing in their last two competitive matches could be the best passing I've seen them have in the last five years. It helps when your opposition forgets all sense of positional responsibility. I was also very impressed with how involved Jack Wilshere was in the attack. * While Chelsea have been spectacular since the opening day of the season, one thing has creeped into their play the last two games that should be worrisome: checking out of matches prior to the ninety minutes ending. Even though Chelsea were well in front both times they did it, it led to their opposition getting enough chances to get themselves back into the game. It was also a nice moment to see 17 year old Josh McEachran come on for the final ten minutes of the match. One other thought; what could the scoreline have been had Didier Drogba not been suspended?